Fabian Delph (born 21 November 1989) is an English professional footballer who plays as a midfielder or a left-back for Premier League club Manchester City and the English national team. Delph represented England at under-19 and under-21 level and made his senior debut in a friendly against Norway on 3 September 2014. Born in Bradford, West Yorkshire on 21 November 1989, Delph started his career in football as a youngster at Bradford City. Delph left City in September 2001 to join Leeds United after he was recommended to their academy coach Greg Abbott by former Bradford manager Paul Jewell, whose son played with Delph. He went to Tong Secondary School, which he left in 2006 to sign a two-year scholarship with Leeds United, at the age of 16 years. He completed his studies at the partner school to Leeds, Boston Spa School. After a string of impressive performances in spring 2007, Delph was made captain of the Leeds Reserves. He was given his debut at Leeds as a substitute in the final match of the 2006–07 season against Derby County on 6 May 2007, a match in which Robert Bayly was also given a debut for Leeds. He was awarded his first professional contract on 11 January 2008, and made two appearances for Leeds in the 2007–08 season, both as a substitute. Delph impressed in the 2008–09 pre-season friendly against Barnet, earning praise from both manager Gary McAllister and former Leeds player Eddie Gray. He made his first League Cup start in Leeds' 5–2 win away at Chester City in the first round on 13 August 2008. Having gained more first-team experience, on 5 September 2008, Delph signed a new four-year contract at Leeds. He celebrated his new contract by scoring his first senior goal the following day as Leeds defeated Crewe Alexandra 5–2. He soon followed it up by scoring twice, both "superb goals" from long range, against Walsall during a 3–0 win. Delph's form attracted the attention of Premier League managers, with Arsenal's Arsène Wenger reported to be lining up a £6 million bid for the midfielder, and Newcastle United having a bid rejected by Leeds chairman Ken Bates. His performances also prompted Stuart Pearce to give Delph his first call-up to the England under-21 squad in November 2008. He was a late substitute for Craig Gardner as England defeated Czech Republic to win his first under-21 cap on 18 November. During the January 2009 transfer window, Leeds rejected another two bids from Premier League for Delph, with Bates saying: "We explained to both clubs that we don't deal in petty cash." The following day he scored a "goal of genuine quality" against Brighton & Hove Albion by finding the top corner of the goal with a curling shot following a long run. Manager Simon Grayson said: "If he scores goals like that, his value is going to go up. It certainly won't go down." Despite the attention of Premier League managers, Delph remained with Leeds as the January transfer window closed. By March 2009, his performances during the 2008–09 season earned Delph a nomination for the League One player of the year, which was won by Leicester City's Matty Fryatt, and helped him to win the young player of the year in the end of season Football League Awards. The awards for the 2008–09 season did not end there, with Delph winning young player of the season, goal of the season, for his strike against Brighton and player's player of the season at the club awards. After Leeds lost out in the playoff semi-finals against Millwall, there was much speculation about Fabian's future at Leeds, however he did manage to play in Leeds' early pre-season matches, before ultimately Leeds turned down offers from other clubs and Delph completed his move to Aston Villa. After Leeds failed to gain promotion from League One, several Premier League clubs including Everton, Manchester City, Fulham, Sunderland, Tottenham Hotspur and Aston Villa were linked with Delph. On 3 August 2009, Villa agreed an undisclosed fee with Leeds for the transfer of Delph to Villa Park. The transfer was concluded the following day after Delph completed a medical and agreed personal terms. Delph's full Premier League debut came at home against Wigan Athletic on 15 August 2009, the first day of the 2009–10 Premier League season. In a match that Villa lost 2–0, Delph received a yellow card and was replaced in the 61st minute by Steve Sidwell. On 23 January 2010 Delph scored his first goal for Aston Villa in the FA Cup win at home against Brighton & Hove Albion. On 17 April 2010, Delph had to be carried away from training on a stretcher after picking up a "serious" knee injury. He was immediately taken for tests on the injury. It was later revealed on 19 April 2010 that Delph had suffered a cruciate ligament injury, set to keep him out of action for up to eight months. Delph returned to action on 26 February 2011, in a Premier League victory over Blackburn Rovers, when he came on as an impromptu left-back after Nathan Baker was injured in the first half. On 3 March 2011, Delph signed a new deal with Aston Villa keeping him at the club until 2015. He scored his second goal for Villa against Tranmere Rovers in the League Cup on 28 August 2012. On 20 January 2012, Delph re-signed for Leeds United on loan, initially until 25 February 2012. He made his second Leeds United debut against Ipswich Town on 21 January. Delph picked up an ankle injury in Leeds' defeat to Coventry City and returned to Aston Villa for treatment on the injury. It was revealed that Delph would miss the end of the season, so his loan at Leeds was not renewed and he returned to his parent club. During the 2012–13 Premier League season, Delph established himself as a regular in Paul Lambert's team, finishing the season with 24 appearances. In the later half of the season, Fabian put in some good performances and began to show a good partnership with Ashley Westwood and Yacouba Sylla in the centre of midfield. Delph started the 2013–14 season very brightly, and put in some of his best performances in a Villa shirt. In the 3–1 away win against Arsenal on the opening day of the season, Delph made a number of successful tackles and dribbles, as well as completing a large number of passes with a high accuracy percentage. He saw a long range, low driven shot from his favoured left foot hit the inside of Arsenal goalkeeper Wojciech Szczęsny's left post, coming very close to his first Premier League goal. His good form continued four days later in a controversial 2–1 loss against Chelsea, and again the following weekend in a 0–1 loss against Liverpool. His first goal of the season came in a 3–0 win over Rotherham United in the League Cup third round. He played a neat one-two with Benteke, took the first touch to control with his favoured left foot and finished with his right within the box. His performances in the opening months of the season earned him the Aston Villa Player of the Month award for August, September and October 2013. Delph scored for the first time in Premier League with "a goal of brutal brilliance" to complete a 3–2 win away at Southampton on 4 December. His performances over the season including stand out performances against Everton, Liverpool and Chelsea, resulted in him being voted Player of the Year by Aston Villa supporters. After reports that he could leave the club at the end of the season due to his contract expiring, Delph signed a four-and-a-half-year contract on 25 January 2015, keeping him at Villa until 2019. On 7 March, Delph scored the first goal as Villa defeated local rivals West Bromwich Albion 2–0 to reach their first FA Cup semi-final since 2010. The victory prompted a pitch invasion by fans, who Delph claimed stole his captain's armband while kissing and biting him. He scored the winning goal in the semi-final on 19 April, as Villa came from behind to defeat Liverpool 2–1 and reach their first FA Cup final since 2000. On 30 May, Delph captained Aston Villa in the 2015 FA Cup Final at Wembley Stadium, where the team were defeated 4–0 by Arsenal. On 10 July, Delph was reported to be having a medical ahead of an £8 million transfer to Manchester City. Delph never showed up for his scheduled medical, and subsequently released a statement on the Aston Villa website confirming he would be staying at the club and would not be moving to Manchester City. However, reports a week later emerged that Delph had again changed his mind and was having a medical at Manchester City ahead of a prospective move. On 17 July 2015, Delph signed a five-year contract with Premier League club Manchester City for a reported fee of £8 million, just six days after saying he would be staying at Aston Villa to captain them into the next season. He made his debut a week later against Real Madrid in the 2015 International Champions Cup at the Melbourne Cricket ground, but was substituted after 18 minutes for Jesús Navas due to injury, and City lost 1–4. Delph scored his first goal for Manchester City on 28 November 2015 against Southampton, the second in an eventual 3–1 win. His third goal for the club came in a 1–0 win over Steaua Bucharest in a Champions League qualifier in August 2016. After an injury to Benjamin Mendy, Delph established himself as Manchester City's starting left-back in the first half of the team's record breaking start to the 2017–18 season. He started 14 consecutive matches in the Premier League, scoring once against Crystal Palace, as City set a new record of 18 consecutive league wins. He was sent off in the FA Cup defeat to Wigan Athletic in February 2018 and then suffered a muscle problem, not returning to fitness until April. In March 2008, Delph started his international career, making his debut as a substitute for the England national under-19 team. On 28 August 2014, Delph was named in the senior England squad for the first time, ahead of a friendly against Norway and the first Euro 2016 qualifier against Switzerland. He made his international debut in the friendly against Norway on 3 September 2014, coming on as a 69th-minute substitute for Alex Oxlade-Chamberlain as England won 1–0. Five days later, in England's first match of UEFA Euro 2016 qualification, Delph made his first start and played the entirety of a 2–0 victory away to Switzerland at St. Jakob-Park, Basel. On 16 May 2016, Delph was announced to have been selected for the provisional UEFA Euro 2016 England squad. However, on 26 May he was ruled out of the tournament with a groin injury. Delph was named in the 23-man squad for the 2018 FIFA World Cup. He made his World Cup debut against Panama, coming on as a 63rd-minute substitute in a 6–1 win. He played the full 90 minutes of the final group game, against Belgium. Prior to his competitive debut for England, Delph was also eligible to represent Guyana through his ancestry. On 23 December 2008, Delph was arrested by police and charged for drink driving in Rothwell, Leeds, while driving home with four friends. He pleaded guilty at Leeds Magistrates' Court to the charge of driving whilst over the limit; he was fined £1,400, disqualified from driving for 18 months and ordered to pay costs of £60. 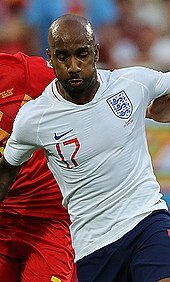 Delph has three daughters, the youngest of whom was born during the 2018 World Cup. ^ "Updated squads for 2017/18 Premier League confirmed". Premier League. 2 February 2018. Retrieved 12 February 2018. ^ Hugman, Barry J., ed. (2010). The PFA Footballers' Who's Who 2010–11. Edinburgh: Mainstream Publishing. p. 114. ISBN 978-1-84596-601-0. ^ "F. Delph: Summary". Soccerway. Perform Group. Retrieved 25 November 2018. ^ "Paul Lambert wants Fabian Delph to get called-up by England". Sky Sports. 6 October 2013. ^ "Fabian Delph". Leeds United F.C. Archived from the original on 31 March 2014. Retrieved 30 March 2014. ^ Leeds United The Next Chapter: Official Handbook 2008/09. Leeds United F.C. 2008. ^ "Youth team provide conveyor-belt of talent". Telegraph & Argus. Bradford. 11 February 2008. Retrieved 11 May 2008. ^ Parker, Simon (15 September 2008). "City can cash in on Delph progress". Telegraph & Argus. Bradford. Retrieved 30 March 2014. ^ Colman, Jon (7 January 2009). "Fab Leeds wonderkid set to take on Carlisle United". News and Star. Carlisle. Archived from the original on 6 September 2012. Retrieved 16 January 2009. ^ a b "Games played by Fabian Delph in 2006/2007". Soccerbase. Centurycomm. Retrieved 7 April 2017. ^ a b "Games played by Fabian Delph in 2007/2008". Soccerbase. Centurycomm. Retrieved 7 April 2017. ^ "Fab's chance". Leeds United F.C. 31 July 2008. Archived from the original on 31 March 2014. Retrieved 30 March 2014. ^ "Mega News Men! Fab Fabian in Euro 2008 squad!". The Square Ball. 26 July 2008. Archived from the original on 31 March 2014. Retrieved 30 March 2014. ^ "Leeds 5–2 Crewe". BBC Sport. 6 September 2008. Retrieved 6 September 2008. ^ "Leeds 3–0 Walsall". BBC Sport. 25 October 2008. Retrieved 25 October 2008. ^ "Arsenal weighing up £6m bid for Leeds star Fabian Delph". Daily Mirror. London. Retrieved 30 March 2014. ^ "England call for Blades' Naughton". BBC Sport. 11 November 2008. Retrieved 11 November 2008. ^ "England U21 2–0 Czech Rep U21". BBC Sport. 18 November 2008. Retrieved 19 November 2008. ^ "Leeds reject approaches for Delph". BBC Sport. 16 January 2009. Retrieved 16 January 2009. ^ "Delph strike adds to growing worth". Telegraph & Argus. Bradford. 18 January 2009. Retrieved 18 January 2009. ^ Sutcliffe, Richard (2 February 2009). "Leeds hold on to star and make double signing". Yorkshire Post. Leeds. Retrieved 2 February 2009. ^ "Ebanks-Blake scoops League honour". BBC Sport. 30 March 2009. Retrieved 30 March 2009. ^ "Beckford and Delph win top awards". BBC Sport. 15 April 2009. Retrieved 11 July 2015. ^ "Leeds United 1 Millwall 1: Match report". The Daily Telegraph. London. 14 May 2009. ^ "Leeds deny Delph link to Everton". BBC Sport. 10 June 2009. Retrieved 11 July 2015. ^ "Man City move for Leeds teenager". BBC Sport. 1 August 2009. Retrieved 11 July 2015. ^ "Grayson – No bids for star duo". Sky Sports. Retrieved 11 July 2015. ^ "Redknapp hails Delph". Sky Sports. Retrieved 11 July 2015. ^ "Fabian Delph: Club statement". Leeds United F.C. 3 August 2009. Archived from the original on 31 March 2014. Retrieved 30 March 2014. ^ "Webflash: Delph signs". Aston Villa F.C. Archived from the original on 13 July 2015. Retrieved 11 July 2015. ^ "Aston Villa haunted by stark reality of no Gareth Barry and Martin Laursen". The Guardian. London. 16 August 2009. Retrieved 9 April 2017. ^ "Aston Villa 0–2 Wigan". BBC Sport. 15 August 2009. Retrieved 2 May 2010. ^ Vesty, Marc (23 January 2010). "Aston Villa 3–2 Brighton". BBC Sport. Retrieved 24 January 2010. ^ "Fabian Delph injury blow". Aston Villa F.C. Archived from the original on 13 July 2015. Retrieved 11 July 2015. ^ "Delph out for eight months". Sky Sports. 19 April 2010. ^ "Delph signs extension with Villa". BBC Sport. 3 March 2011. ^ "Aston Villa 3–0 Tranmere". BBC Sport. 28 August 2012. Retrieved 28 August 2012. ^ "Leeds United re-sign Aston Villa's Fabian Delph on loan". BBC Sport. 20 January 2012. Retrieved 11 July 2015. ^ "Fab to miss Rovers clash". Leeds United F.C. 16 February 2012. Archived from the original on 31 March 2014. Retrieved 30 March 2014. ^ "A not so Fab ending for Delph". Leeds United F.C. 22 February 2012. Archived from the original on 31 March 2014. Retrieved 30 March 2014. ^ Fifield, Dominic (4 December 2013). "Fabian Delph's late strike earns Aston Villa thrilling victory at Southampton". The Guardian. London. Retrieved 28 May 2014. ^ "He's fab! Villa fans vote Delph their player of the year". Aston Villa F.C. Archived from the original on 11 July 2015. Retrieved 11 July 2015. ^ "Fabian Delph: Aston Villa midfielder extends contract". BBC Sport. 25 January 2015. Retrieved 25 January 2015. ^ "FA Cup pitch invasion: Villa Park scenes disgraceful – Tony Pulis". BBC Sport. 7 March 2015. Retrieved 8 March 2015. ^ "Aston Villa 2–1 Liverpool". BBC Sport. 19 April 2015. Retrieved 19 April 2015. ^ a b McNulty, Phil (30 May 2015). "Arsenal 4–0 Aston Villa". BBC Sport. Retrieved 25 November 2018. ^ "Fabian Delph to have Manchester City medical ahead of £8m move from Aston Villa". Sky Sports. Retrieved 11 July 2015. ^ "Fabian Delph: Man City set to sign Aston Villa captain". BBC Sport. Retrieved 11 July 2015. ^ a b "Fabian Delph statement". Aston Villa F.C. 11 July 2015. Archived from the original on 13 July 2015. Retrieved 17 November 2015. ^ "Delph deal back on". Manchester Evening News. Retrieved 17 July 2015. ^ "Fabian Delph: Manchester City sign Aston Villa captain". BBC Sport. 17 July 2015. Retrieved 17 July 2015. ^ "Fabian Delph moves to Manchester City from Aston Villa for £8 million". ESPN FC. 17 July 2015. Retrieved 17 July 2015. ^ "Man City: Fabian Delph injured on debut in defeat by Real Madrid". BBC Sport. 24 July 2015. Retrieved 24 July 2015. ^ "Aston Villa 0–0 Manchester City". BBC Sport. 8 November 2015. Retrieved 10 November 2015. ^ Jackson, Jamie (24 August 2016). "Fabian Delph's header helps Manchester City push past Steaua Bucharest". The Guardian. London. Retrieved 27 October 2016. ^ "How Fabian Delph became Pep Guardiola's born-again full-back". The Daily Telegraph. London. 21 October 2017. ^ "Manchester City have won 18 games in a row: Who can stop them now?". Sky Sports. 27 December 2017. ^ "Liverpool v City: Aguero, Delph injury latest". mancity.com. 3 April 2018. Retrieved 16 April 2018. ^ "Tomkins at the double". The Football Association. 25 March 2008. Retrieved 30 March 2014. ^ "Roy calls up four new faces for Norway and Switzerland". The Football Association. 28 August 2014. Retrieved 28 August 2014. ^ McNulty, Phil (3 September 2014). "England 1–0 Norway". BBC Sport. Retrieved 3 September 2014. ^ "Switzerland 0–2 England". BBC Sport. 8 September 2014. Retrieved 8 September 2014. ^ "Euro 2016: Marcus Rashford makes England provisional squad". BBC Sport. Retrieved 21 May 2016. ^ "Manchester City midfielder Fabian Delph out of Euro 2016 after suffering groin injury". Metro. 26 May 2016. Retrieved 16 April 2018. ^ Pollard, Rob (27 June 2018). "World Cup Player Focus #9: Fabian Delph". Manchester City F.C. Retrieved 5 July 2018. ^ McNulty, Phil (24 June 2018). "World Cup 2018: England put six past Panama to reach last 16". BBC Sport. Retrieved 5 July 2018. ^ McNulty, Phil (28 June 2018). "World Cup 2018: England lose 1-0 to Belgium in final group game". BBC Sport. Retrieved 5 July 2018. ^ "Where have the Golden Jaguars been hiding?". Guyana Times. 19 January 2014. Archived from the original on 30 May 2014. ^ "Footballer in drink drive charge". BBC News. 29 December 2008. Retrieved 29 December 2008. ^ Robinson, Stuart (27 January 2009). "Leeds United star banned for drink driving". Yorkshire Evening Post. Leeds. Retrieved 28 January 2009. ^ "World Cup 2018: England's Fabian Delph welcomes third daughter". BBC Sport. 4 July 2018. Retrieved 5 July 2018. ^ "Games played by Fabian Delph in 2008/2009". Soccerbase. Centurycomm. Retrieved 1 April 2016. ^ "Games played by Fabian Delph in 2009/2010". Soccerbase. Centurycomm. Retrieved 1 April 2016. ^ "Games played by Fabian Delph in 2010/2011". Soccerbase. Centurycomm. Retrieved 1 April 2016. ^ a b "Games played by Fabian Delph in 2011/2012". Soccerbase. Centurycomm. Retrieved 1 April 2016. ^ "Games played by Fabian Delph in 2012/2013". Soccerbase. Centurycomm. Retrieved 1 April 2016. ^ "Games played by Fabian Delph in 2013/2014". Soccerbase. Centurycomm. Retrieved 1 April 2016. ^ "Games played by Fabian Delph in 2014/2015". Soccerbase. Centurycomm. Retrieved 1 April 2016. ^ "Games played by Fabian Delph in 2015/2016". Soccerbase. Centurycomm. Retrieved 14 June 2016. ^ "Games played by Fabian Delph in 2016/2017". Soccerbase. Centurycomm. Retrieved 19 July 2017. ^ "Games played by Fabian Delph in 2017/2018". Soccerbase. Centurycomm. Retrieved 14 July 2018. ^ "Games played by Fabian Delph in 2018/2019". Soccerbase. Centurycomm. Retrieved 23 April 2018. ^ "Delph, Fabian". National Football Teams. Benjamin Strack-Zimmerman. Retrieved 23 April 2018. ^ McNulty, Phil (28 February 2010). "Aston Villa 1–2 Man Utd". BBC Sport. Retrieved 25 November 2018. ^ "Fabian Delph: Overview". Premier League. Retrieved 15 May 2018. Wikimedia Commons has media related to Fabian Delph.